Home renovations can increase the efficiency, comfort, and aesthetics of a home. While the overall style and comfort of the entire home are important, a home’s kitchen can be a great place to start. This is especially true seeing as how even a minor kitchen remodel project can have an average return on investment of 82.7%. With that in mind, let’s take a look at a few other benefits kitchen remodels can offer homeowners. Reduce energy costs. By choosing to upgrade your current kitchen appliances to newer, more energy-efficient models, you can significantly reduce the amount of energy that is used in your kitchen. When shopping for appliances, look for the energy rating on their label and try to choose ones that meet the energy efficiency standards. This can be a great way to not only save on energy expenses but give your kitchen a modern makeover too. A general contractor should be able to help you decide between appliances if you’re having a hard time making a decision. Provide extra space. When it comes to kitchens, there are a lot of tools and equipment that need to be stored. From blenders and crockpots, to plates and cups, to plastic containers, it may seem like there’s always clutter on the counters due to lack of space. Luckily, a home remodeling contractor can help with this. By designing your new kitchen with ample storage space, whether it’s on the walls or in a new island, you’ll have a place for each of your kitchen items. Update the style. 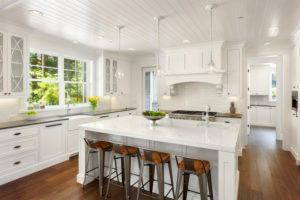 While kitchens are often a central focus of a home, they sometimes get placed on the back burner when it comes to remodeling. If the rest of your house is up-to-date in style, it’s time to give your kitchen some love too. Fortunately, it can be fairly easy to update your kitchen’s look if you’re looking for a small, inexpensive project. You can simply repaint the walls and cabinets as well as replace cabinet hardware. Or if you want to completely remodel the area, think about replacing the cabinets, flooring, and countertops for a fresh, new look. Even minor home remodeling and renovations can completely transform a home. A kitchen remodeling project is a great way to increase the comfort and aesthetics of your home while providing an area the whole family can enjoy together.